So, Easter is now over! It was a busy period, making lots of large handpainted Easter eggs (each one a little different, each one with it’s own quirks), mini eggs and mini chickens. 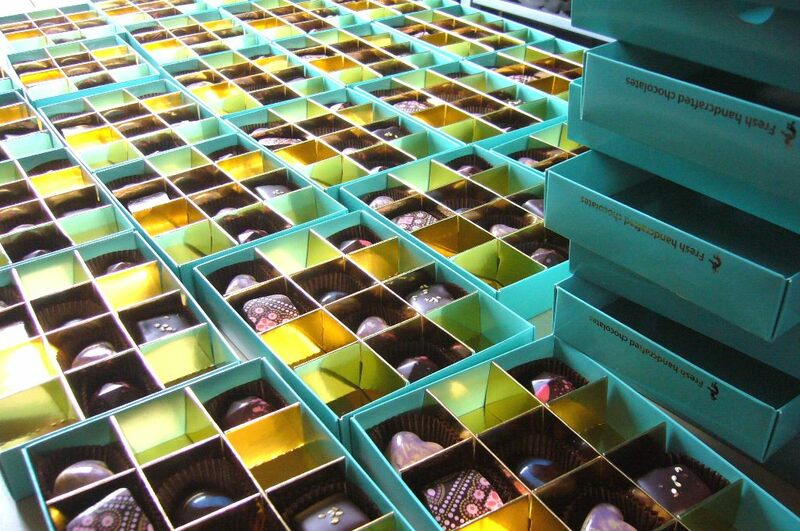 Preparing for Easter trading is a lot of work – imagine hand-making and packaging thousands of chocolates in just a week or two! 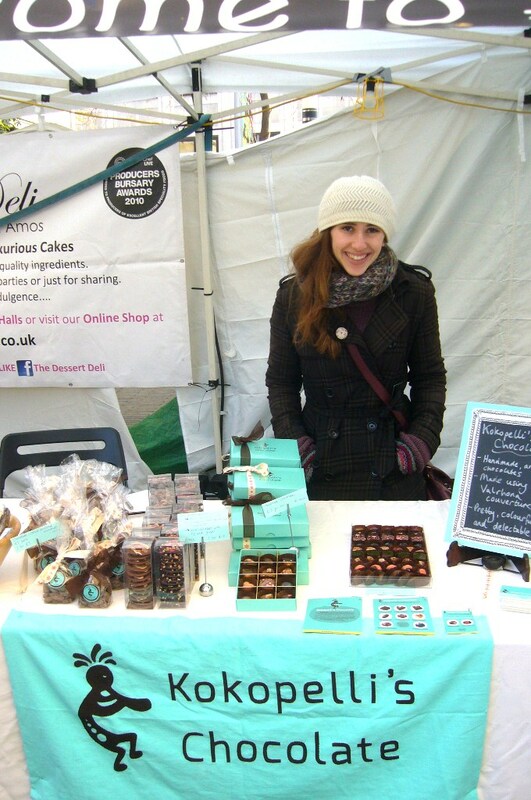 We spent an extremely cold three days at The Chocolate Festival, braving the wind, rain, snow and sub-zero temperatures. It was actually colder than the December Festival! Luckily there were lots of lovely people there to meet or catch up with, and lots of top notch chocolate to keep us going (especially the delicious, rich hot chocolate from Jaz and Jul’s, with their melt-in-the-mouth vegan marshmallows). 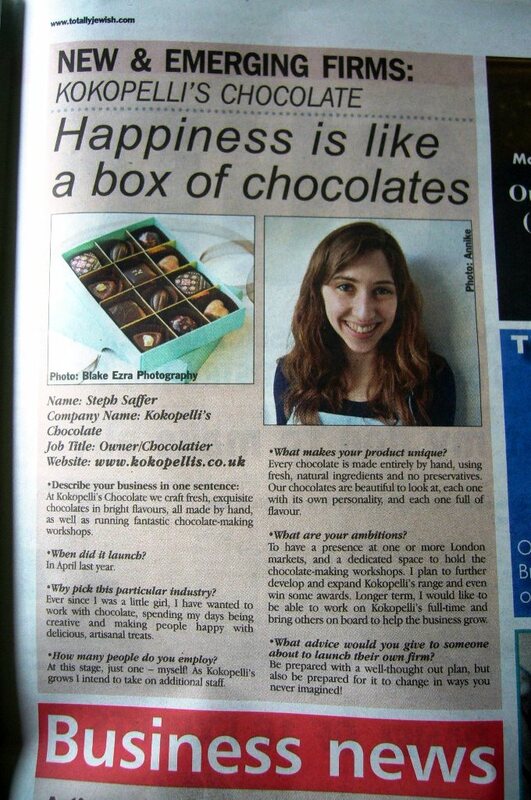 One lovely lady who had enjoyed chocolates from us before said she uses her Kokopelli’s box to keep her earrings in – I adored that! Quite a few food bloggers came along and wrote some very nice things about us. You can read them at Where The Wild Things Are, savannahsunset, Dining Belles and Chocolate Couverture. 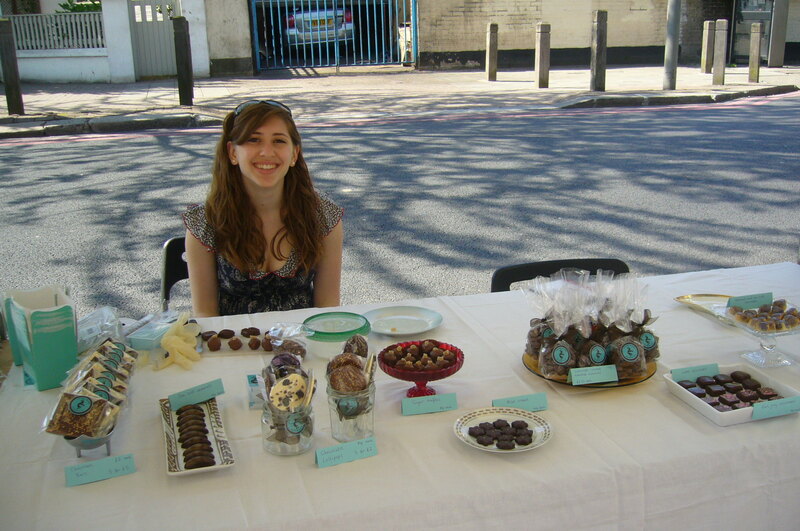 We also ran an Easter chocolate stall in a swanky office in the City of London (thanks to Anna for helping out). This was a very civilised affair, nice and warm indoors without having to worry about products and signs flying away in the wind! 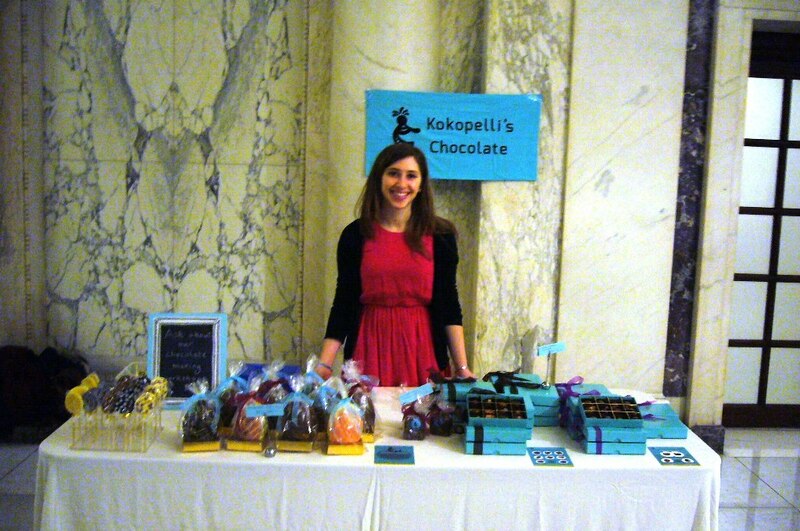 I always like talking to new customers about our chocolate and telling Kokopelli’s story. Our handpainted Easter eggs went down very well. As much as I enjoyed the Easter rush, it’s nice now to have some time for planning, reflection and product development. We also have a lot of workshops booked in for the summer so this will be a good change of pace for a few months. Springtime is here! I can see it in the daffodils and sense it in the (slightly) warmer weather. Hoorah! And with spring, comes Easter, just two weeks away now. 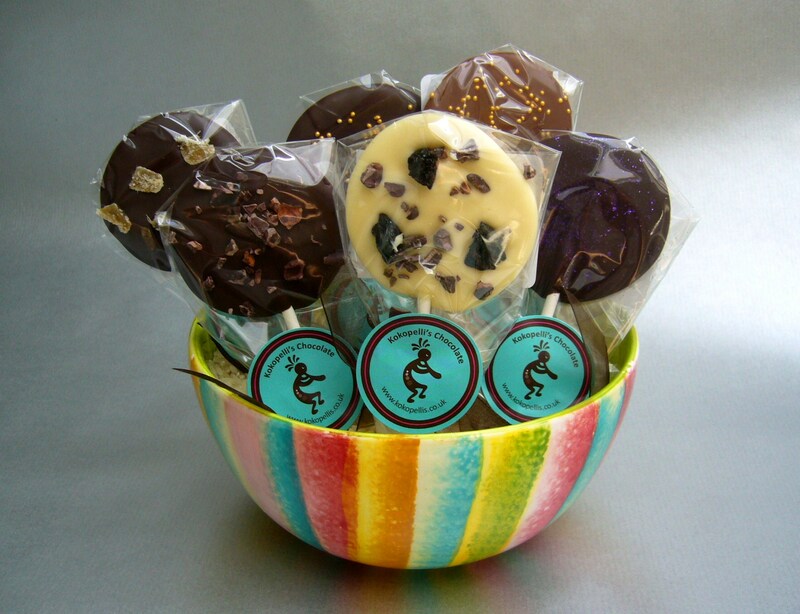 I am really excited to present Kokopelli’s ridiculously adorable Easter Collection, available at our online shop. 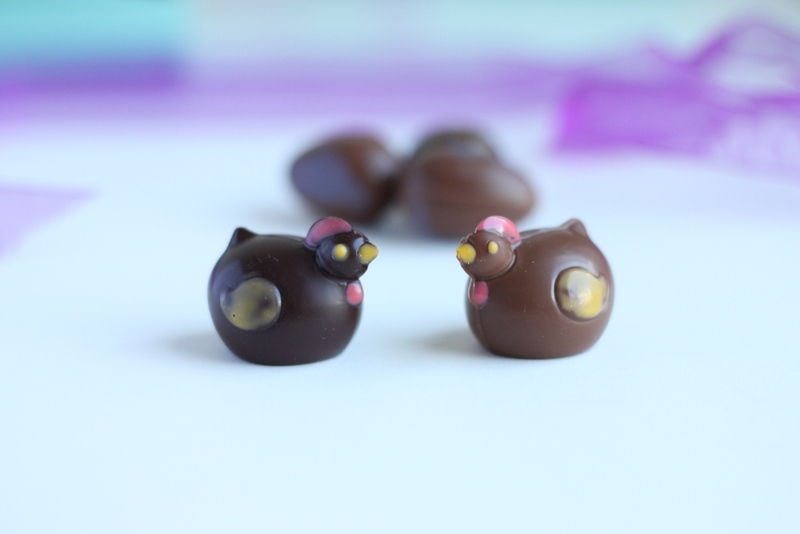 Our signature box contains four handpainted chocolate hens, two cast in solid dark chocolate, two in milk. Meticulously painting each one is a labour of love! These sweet little chickens are surrounded by eight chocolate eggs. 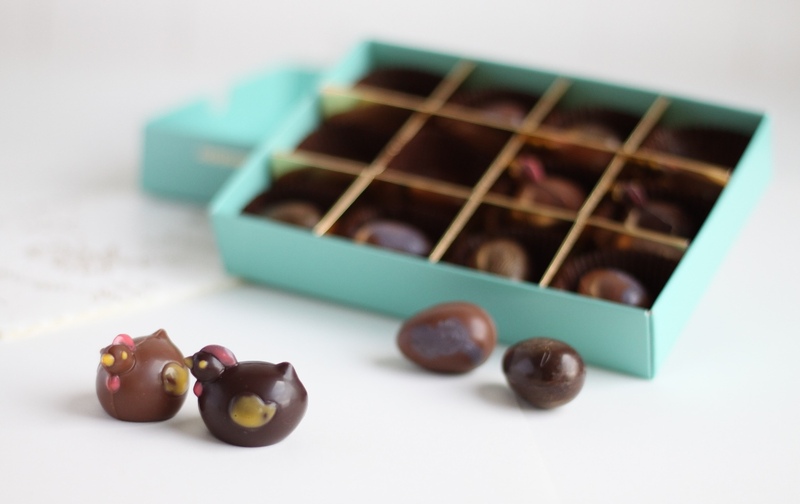 Four have dark chocolate shells, filled with a zesty lemon-infused caramel and brushed with golden lustre dust. Four have milk chocolate shells and contain a smooth malted milk chocolate ganache, handpainted with lilac cocoa butter to highlight the design on the egg. Cute, right? 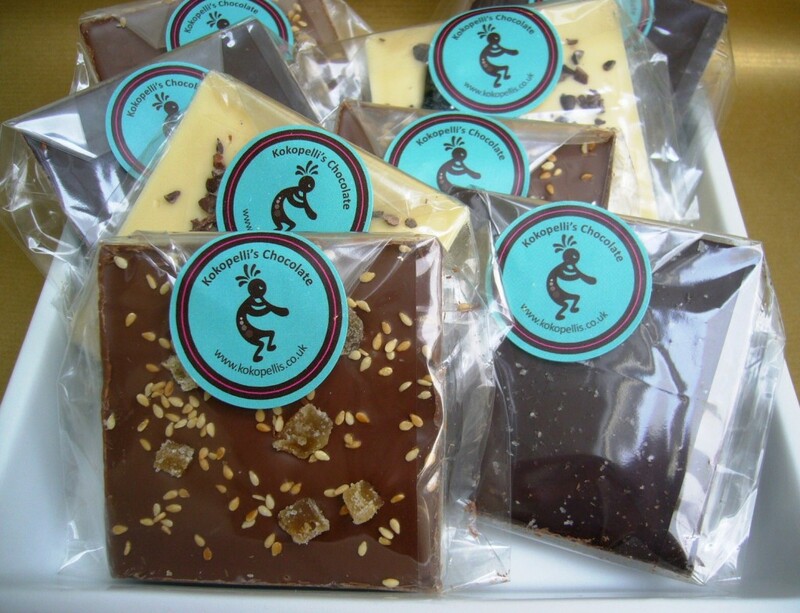 We will be at The Chocolate Festival again in London next weekend (22nd-24th March), where we will be selling all manner of chocolatey goodness, including these lovely chickens and eggs, Easter eggs, chocolate lollipops, as well as our year-round chocolates, and other sweet delights too. If you’re around London do pop down and say hello! It’s a fantastic event, with demonstrations, talks, beautiful things to look at and eat, and some of the country’s top chocolatiers all in one place. For a whole weekend. Come! Huge thanks to the highly talented Talia of Macnifique for the gorgeous photos. Check out her out – not only is she a talented photographer, she is also a wonderful pastry chef! First up, it is with immense excitement that I can announce our brand spanking new ONLINE SHOP is up and running! 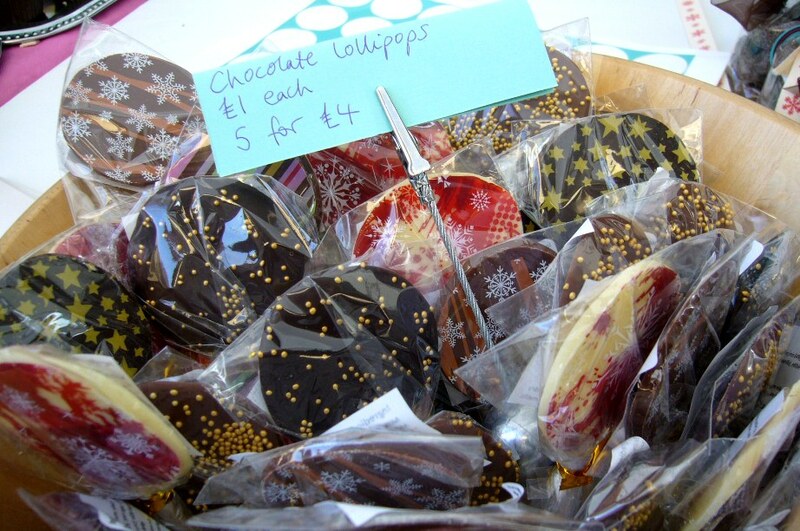 Get your Christmas orders in before Wednesday 19th December. Go, go, go! So, The Chocolate Festival has now been and gone, and I am finally able to relax a little. Truth be told, I was a little nervous in the seemingly long run-up, planning products, ordering materials and ingredients, writing risk assessments, actually making the chocolates, packaging everything, and so on. I don’t think I’ve ever worked so hard in such a short space of time (our chocolates have a short shelf life, so they all had to be made very close to the Festival). Luckily I had several generous helpers. It turned out to be a fantastic event – 3 full-on, very cold days of talking and tasting chocolate with some lovely (and some eccentric) people. We made a lot of sales and got some excellent and useful feedback on our products and branding. 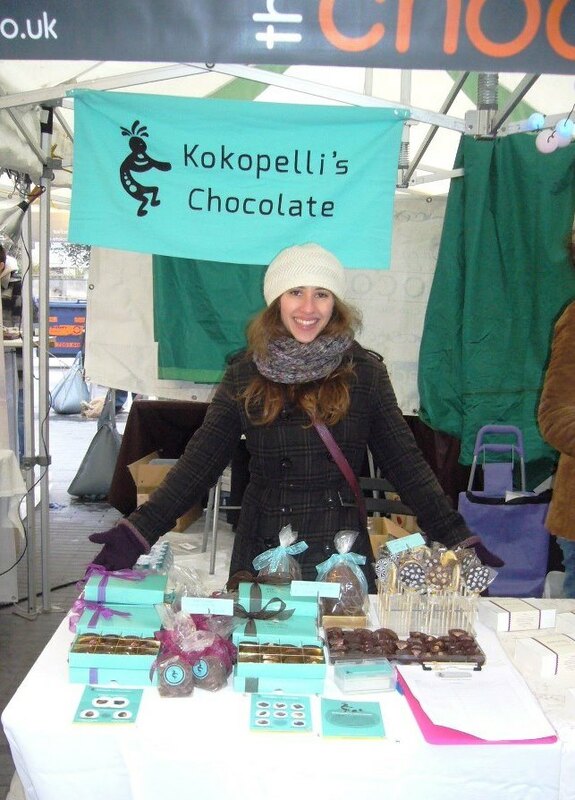 A lot of people walked around the whole market several times and came back to us, choosing Kokopelli’s over all the other offerings. 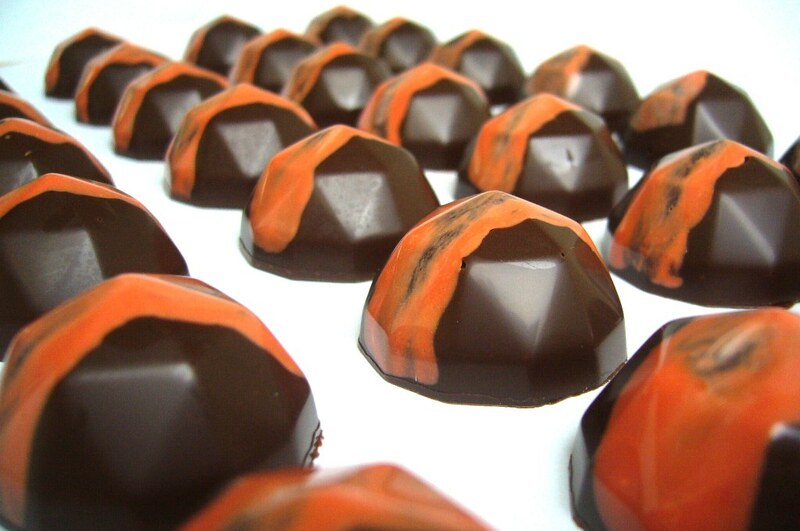 Many said that our chocolates stood out, that they were works of art, that some looked like marbles, that they were boldly flavoured (especially our lime chocolate). Every time someone uttered something like this, I got a little thrill and felt rather proud. Check out my hand-stitched banner, finished in the early hours on the first morning of the Festival! Enormous thanks go to my helpers, without whom I wouldn’t have been able to do it – Memit, Mum, Dad, Julia and Eli. Big thanks also to all of you who came down specially to support Kokopelli’s! It was really lovely to see your friendly faces and kept me going when I couldn’t feel most of my body for the cold. ‘Til next year! The holiday season is almost upon us – I can feel the first excitement and chill of it in the air. Lots of preparations are happening behind the scenes at Kokopelli’s. We have beautiful new boxes, new menus on the way, new seasonal chocolates, and lots of website development work going on – online shopping is now closer than ever! 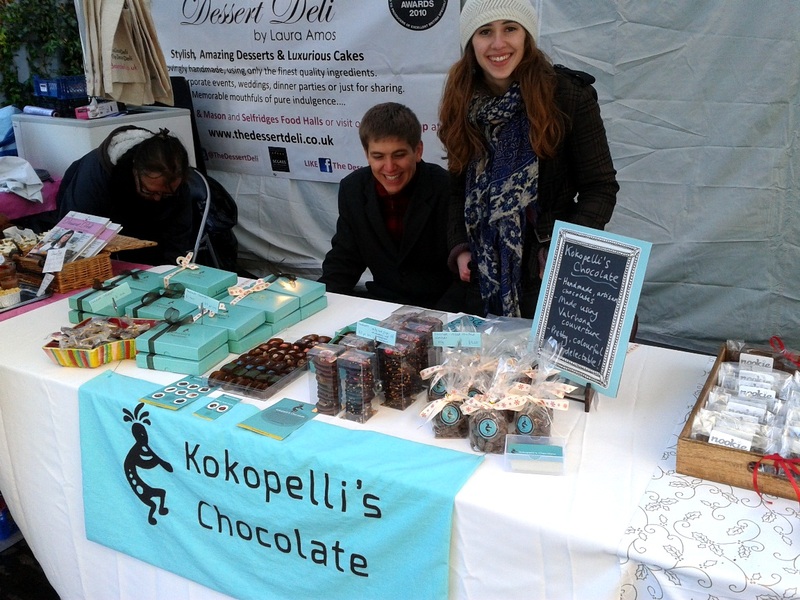 I’m also excited to announce that Kokopelli’s will have a stall at The Chocolate Festival next weekend – from Friday 7th – Sunday 9th December. It’s at the Southbank Centre and it would be great if you popped by to say hello. It’s a really fantastic event showcasing the country’s top chocolatiers. 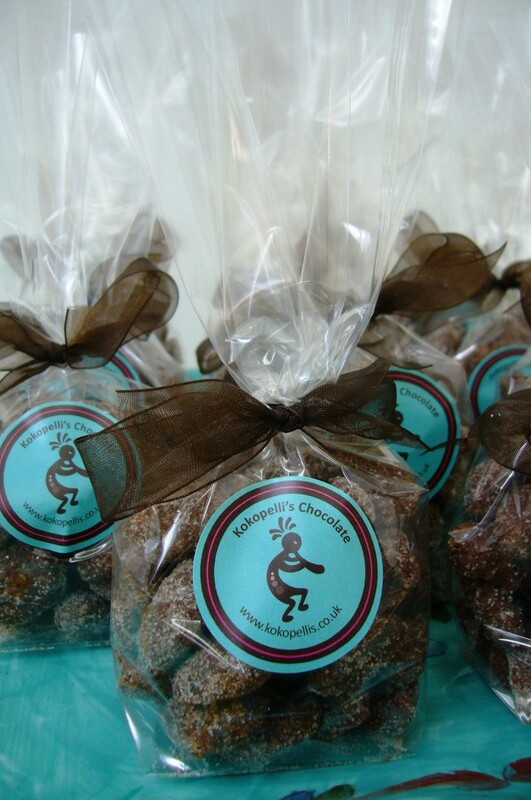 A soft caramel delicately spiced with cinnamon, cloves, ginger, cardamom and fennel. 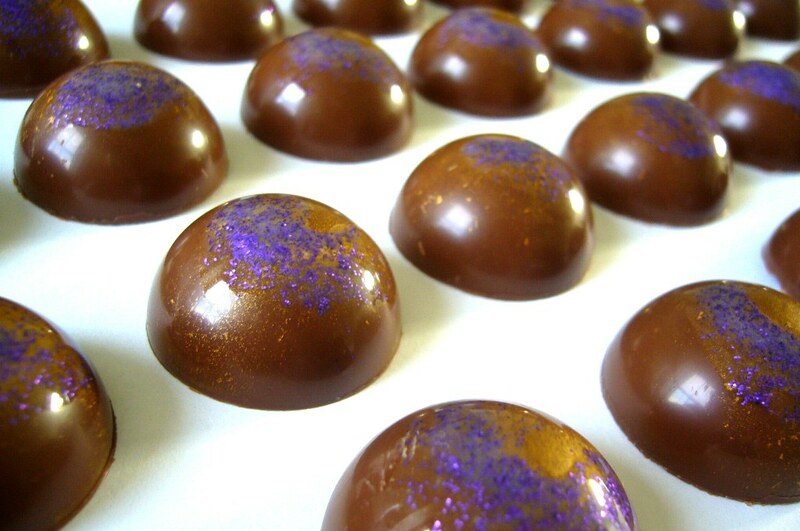 Housed within a milk chocolate shell decorated with festive purple glitter and a touch of gold lustre. 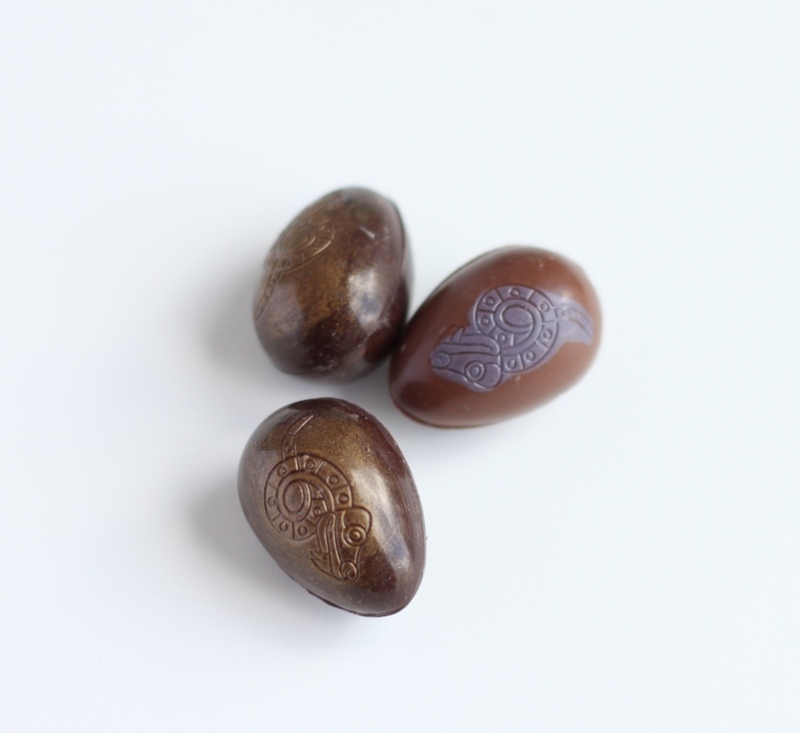 Dark chocolate gem-shaped shell, striped with quince-coloured cocoa butter. Filled with a milk chocolate ganache, blended with quince puree, my favourite winter fruit with a wonderful perfume. 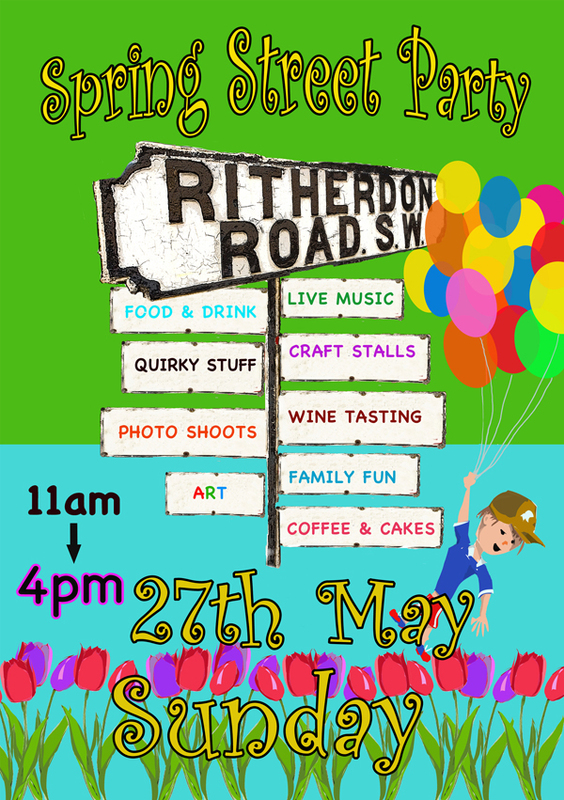 It was a swelteringly hot but enjoyable day at the Ritherdon Road street party. It was great talking to the friendly people of Balham, getting feedback and generally enjoying the relaxed, summery atmosphere. There was even a local ukulele band! The best bit though was watching people’s faces as they tried a salted caramel for the first time, or tasted an earl grey chocolate, or marvelled at the combination of chocolate with lime as it melted in their mouths. My gooey fudgey bites went down a treat with both kids and adults (recipe here). They were the first thing we sold out of – so fast, in fact, that there was no time to take a picture. I must admit I snuck one or two for breakfast while we were setting up. They are a little bit irresistible. 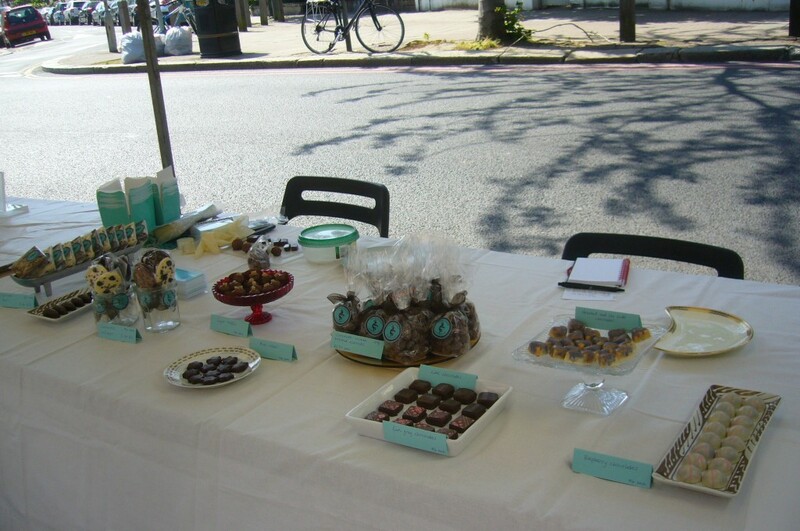 We also had a selection of truffles and chocolates including ginger truffles, earl grey chocolates, hazelnut and sea salt hearts, lime chocolates, raspberry chocolates, mint creams and sea salt caramels. The sea salt caramels were the bestsellers – I think personal taste will dictate the popularity of the others, but who could turn down a sea salt caramel? Big thanks goes to everyone who helped out or came down to support Kokopelli’s!